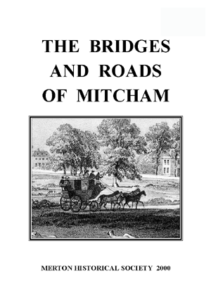 Bridges and Roads deals first with the construction and maintenance over the centuries of Mitcham’s bridges over the Wandle and the Graveney, and then with the history of its turnpike highways and its parish roads. The last section looks at some of the more romantic aspects of road travel in the past. There is a useful index. ‘Monty’ has distilled his notes on this subject accumulated over some years into this booklet, which is illustrated with maps and pictures, and fully annotated. centuries later, was to become the parish and borough of Mitcham. throughout the Middle Ages and beyond. much of the road still endures, albeit in a modern guise. Coaches” – Newspaper cutting in scrapbook. 4 Merton Local Studies Centre. being extracts from an address given by his son, John Marsh Pitt. 5 Merton Local Studies Centre. Tom Francis’s lecture notes. 6 Drewett J. D., ‘Memories of Mitcham’ in Old Mitcham II (1926) Gen.
History Society, in a pers. comm., Nov. 1998.
operative Society Supermarket built between 1986 and 1988. 18 Smith R. P., ibid. 33. 1 Surrey History Centre. Mitcham Land Tax records. 6 Hassell J., Picturesque Rides and Walks I (1817) 116.
but the date when the first road bridge was constructed is lost in antiquity. an impressive gatehouse that fronted what is now Merton High Street. just to the west of where today Mill Road joins the High Street. were utilised in the construction of the bridge. anyone responsible for its repair. Bray III (1814) Appendix L.
Moorfields for use as a burial ground for the poor of London. 16 Graham Gower, of the Streatham Society, in a personal communication. 17 Croydon Local Studies Library. William Marr’s map dated 1685. “Mitcham Bridge” is clearly marked. 21 Surrey History Centre. Mitcham poor rate books. Centre. Supplied in a personal communication. the case of others it was no easy matter to establish liability for repair. on bridge maintenance (recoverable by a rate on property) rose steadily. pedestrian footbridge with hand rails was later constructed at the side. 2. TERRIER’S BRIDGE, COLLIERS WOOD. Wood, in this case carrying the main road over the river Graveney. to join the main river near Summerstown. on the justices’ instructions and at the cost of the county. that the under-arch was of tile, not brick. 11 Merton Local Studies Centre. Mitcham Vestry Minutes. rode on horseback, as was the universal custom at that time. day’s rat or otter-hunting with their dogs. its course until Byegrove Road is reached. boundary between the London Boroughs of Merton and Wandsworth. many local livestock markets, of which Ewell fair was an example. that “prior to the occupation of the end cottage by old Mr Legg” (i.e. and from the Wandle flour mills. fixed on the southern parapet. John R. Perring, Past Master of the Merchant Taylors Company. thereafter transferred his patronage to The Six Bells at Colliers Wood. elected to travel to and from Epsom by the new railway. older residents can still faintly remember at the side of Mitcham Bridge. coaches, and pack animals being expected to use the adjacent ford. authorities if at all possible. the ford was never reopened. reinforcements were necessary to preserve order. main roads, and the nuisance was largely abated. repair of the new bridge and road he constructed. himself on a good horse. years more the family business was continued by Walter and Frederick. the Mitcham scene by the early 1920s. station, a direct line was available to London and the South Coast. who were fit but could not afford the fare had to go by ‘Shanks’s pony’. century, when ‘Old Mitcham’ itself was fast disappearing. The gentleman concerned was Sir Gregory Lovell, cofferer, i.e. would certainly need to be crossed, either by a bridge or a ford. Waddon and Carshalton to the Thames at Wandsworth. voluntarily by local gentry at their own expense. other charities run by the Merchant Taylors’ Company. approach to the repair of the roads fell far short of what was needed. out while the going was good. later built as extensions covering the front garden. evening. The single fares charged were 2s. 6d. (12.5p) inside and 1s.6d. majority of the ordinary people of Mitcham. with over 40 coaches running to and from London and Brighton daily. had completely vanished from all the Brighton roads by 1862.
the fourth generation, was living at 4 Commonside West by 1841.
elsewhere. Geese and ducks were also driven to market in huge flocks. what one contemporary writer described as a “fantastic quagmire”. cash in on the boom. enforcement undoubtedly would have varied from district to district. and turnpike, under which English roads were maintained in his day. sanitary authorities – a division which in essence remains today. 1837 and 1850 the revenue received in tolls decreased by one third. The lane leading to Mitcham lies just beyond the toll gate, on the left. Colliers Wood Underground station now occupies the site of the cottage. road from the Elephant and Castle to East Grinstead via Streatham. road widening in the 1960s. Wood gate by making the detour through Mitcham! during World War II and not replaced, or set aside during road widening. Bells and engraved “Whitehall 8 miles” and “Cornhill 9 miles” is typical. interest in the concept of toll roads in Britain. wagons on the way to the maltings were making the road impassable. milestones erected at this time can still be seen. fellow trustees were no doubt gentlemen of similar standing. constructed to a high standard. trustees may, as near as possible, be always complete. London Road, Mitcham, with Figges Marsh to the left (c.1975). Streatham Road in the late 19th century. The fence of Gorringe Park is on the left. This entry was posted in Publications, Booklets, Publications and tagged in georgian mitcham, late georgian mitcham, medieval mitcham, mitcham, tudor&stuart mitcham, victorian mitcham.